Stafford May, the club’s current president and a member since 1967 (and before that a member of one of the three clubs which merged to form CLTC) has put together a comprehensive historical account of the club’s history. Stafford’s energy and perseverance for tracking down information relating to the early history of the club is quite staggering. He searched the archives at St John’s and Gonville and Caius Colleges, he must have taken up residence at the Cambridgeshire Collection – and what he uncovers is revealed page by page, with the aid of maps, photos, lists of officials, letters, etc. Spot the man posing for a group photo smoking a pipe. Or wish yourself back to 1955 when a men’s singles final ticket at Wimbledon cost 22 shillings. Stafford has researched different aspects of the club, that make up the rest of the book, with the same eye for detail. One example is the chapter on courts and facilities. Figuring out when courts were laid, what surface they were made of, what they cost and who carried out the work must have been a complex task. As was the recording of all the tournaments and competitions that the club has run over 40 years. 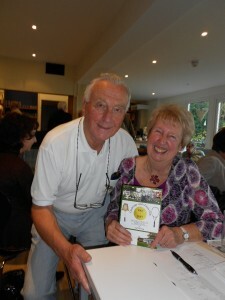 Copies of the book can be purchased from the club office. £8.00 for members and £10.99 for non-members.